March 23, 2010  In 1975, Michael Abramson decided to photograph the blues clubs of Chicago. The pictures Abramson took in Pepper's Hideout, among other venues, have been released in a set called Light on the South Side. Jazz critic Ed Ward takes a listen to Pepper's Jukebox, the CD released along with the photographs. 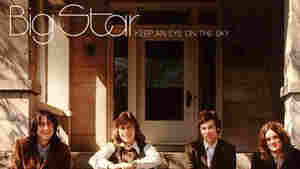 February 2, 2010  The '70s Memphis-based rock band Big Star won rave reviews for their albums and influenced countless followers, but never managed to become stars. Rock and Roll historian Ed Ward says a new box set and a collection of recordings by founding member Chris Bell offer a chance to look back on the band's troubled life. October 28, 2009  Dobie Gray, in his hit "The In Crowd," famously said, "The original is still the greatest." But is it? Ace Records in London has put out a CD called You Heard It Here First!, with 26 original versions of hit songs. Rock historian Ed Ward takes a look. September 24, 2009  The volatile and eclectic music scene of 1960s Los Angeles comes together in a new box set issued by Rhino Records. Critic Ed Ward gives it a listen. September 18, 2009  The Beatles Remasters promises a clearer sound and truer look at the group's music catalog. Rock historian Ed Ward takes another listen to the iconic British band and finds that there's always more to discover. August 25, 2009  Few groups get to achieve a 50th anniversary, but the pioneering American folk trio the got to do just that this year. The release of a three-disc commemorative set by the New Lost City Ramblers was darkened, though, but the death of co-founder Mike Seeger. August 18, 2009  A founding member of the Fairport Convention and a legendarily accomplished guitar player and songwriter, he's celebrated in a new four-disc career overview from the Shout Factory label. August 14, 2009  Is it true that there was no good music at Woodstock? Critic Ed Ward considers the evidence. July 27, 2009  The Translantic Feedback, a documentary about an oddball band of American ex-GIs dressed up like monks and singing bitter songs, is out on DVD at last. Ed Ward explains the appeal of The Monks. July 15, 2009  Walter Jacobs, aka "Little Walter," was a harmonica virtuoso whose life was consumed by blues music. A new five-disc Hip-O Select re-release of Walter's complete recordings for the record label Chess is on shelves now. May 18, 2009  The rise of the San Francisco rock scene in the mid-1960s is a well-known story, but one which might have taken an entirely different direction if Frank Werber's fortunes had played out differently. May 4, 2009  Rock historian Ed Ward remembers the Detroit label Westbound Records, which recorded early funk, disco and gospel in the 1970s. April 23, 2009  Rock historian Ed Ward explains how New York City's Tin Pan Alley songwriters coped with changing times in the 1960s. March 23, 2009  Two albums featuring the late rock 'n' roll icon have been released — Memorial Collection and Down the Line: Rarities. Rock historian Ed Ward considers Holly's music and tragic death.